Our Thanks Multiplied By The Number Of Stars! Because we are a small and humble organization, your ongoing support of Liberian Youth is beyond measure…like trying to count all the stars in your lifetime. You are celebrated and honored by your students﻿because you give them the opportunity to learn skills that will change their lives for the better. That is what we call Startacular! On this Day of Thanksgiving, we want to express our heartfelt, overflowing appreciation and gratitude for the confidence, hope, and supportive learning environment you give to young men and women in Liberia! 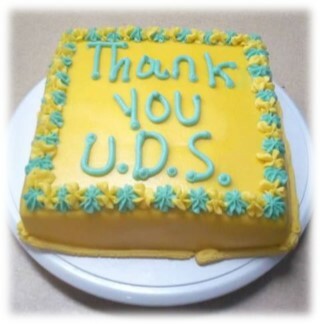 Your catering student made this cake especially for you because without your support, they would not have come this far. Elijah Kotte (catering student) shares his thanks and appreciation to you on the behalf of all his fellow students. This entry was posted in Africa, Cake, Catering Course, Learning, Liberia, Stars, Students, sustainable development, Trade School, Uniting Distant Stars, vocational training, Youth, youth development, Youth Empowerment and tagged Africa, Cake, Catering Course, Give to the Max Day, Liberia, Skills Training, Thank You, trade school, Uniting Distant Stars, Vocational Training, Youth Development, Youth Empowerment. Bookmark the permalink.